It’s as simple as getting one of those cheap slip-in photo albums and dropping your goodies into the plastic pockets. 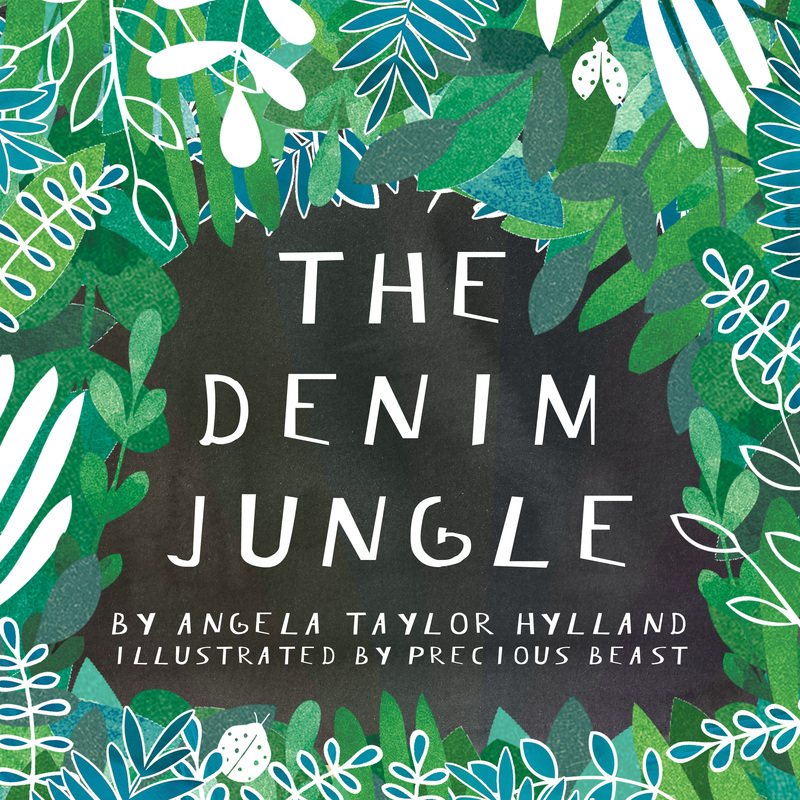 Plus, your kids will love paging through it with you and hearing stories about places and things they’ve yet to experience, like tuk-tuks and Casa Batlló. You could also take pictures of mementos, mix them in with your photos, and print a digital album on a site like Shutterfly or Snapfish. 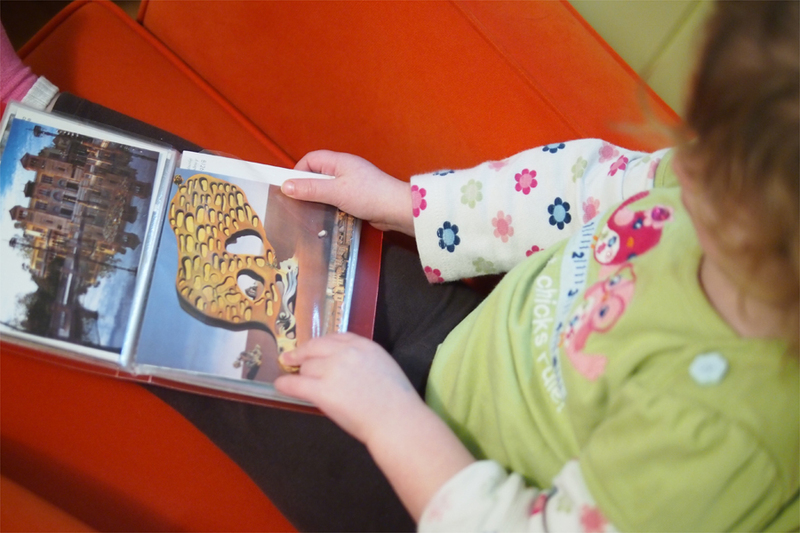 If you grab two copies of brochures or post cards (as we often do), it’s easy to make them into a matching game for your kids, ala Memory. Cut them all to the same shape and size. Paint or cover the back to a uniform design or color. Cover with contact paper (optional). You can go easy or more involved with this one. Easy: Buy a frame. Insert picture or postcard. Done. More involved: You can make a collage, can’t you? Or course you can. And the kids can help. 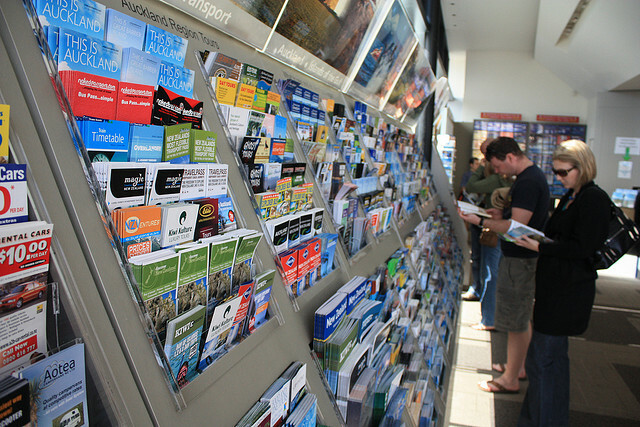 Paste pictures, postcards, and bits of brochures onto a piece of poster board cut to fit the size of your frame. (Poster frames work well for this.) If you get bored with the piece over time, it’s super easy to take it out of the frame, cut it into six or so page-size pieces, and paste them into a scrapbook. That’s right, diorama. It’s not just for kids. Get a shadow box from a craft store. 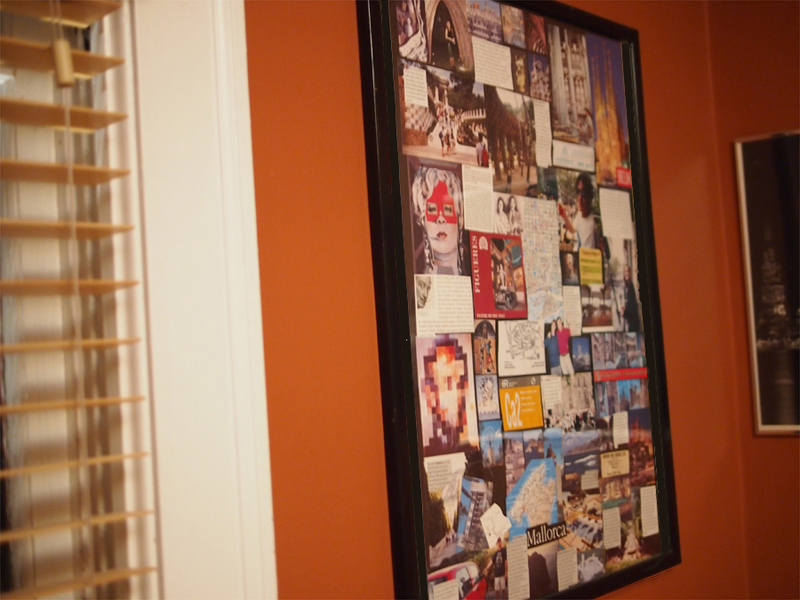 Paste in sentimental bits and pieces from your trip. Display. Done. Line the back with a map. Save money by making your own shadow boxes, like these. Use ornaments and souvenir trinkets for fun 3-D additions. I mentioned this idea before as a gift to help families remember someone special. It can just as easily help you remember a place, too. Get how-to details here. Cut out people, buildings, and treasures, and cover them with contact paper. Then give them to your kids for imaginative play. 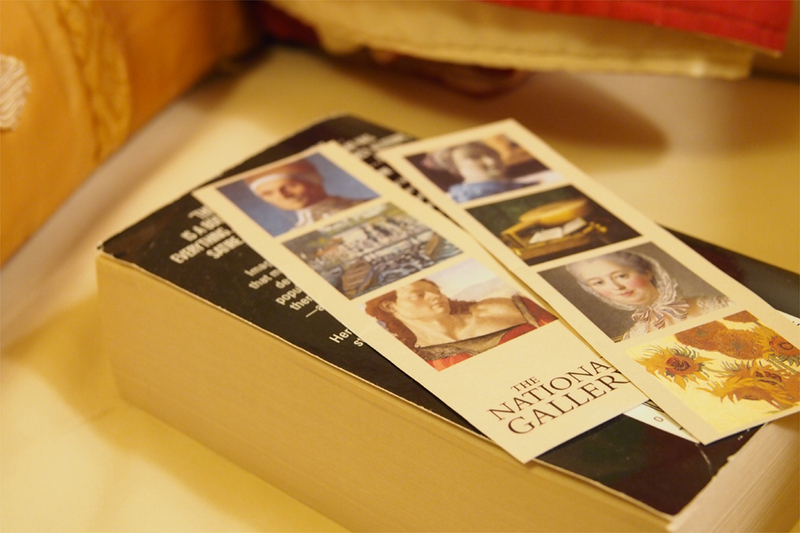 Have your photos (or photos of your brochures, maps, tickets, postcards, and trinkets) printed onto coasters like this. Or swap treasures in and out with a customizable coaster set like this. 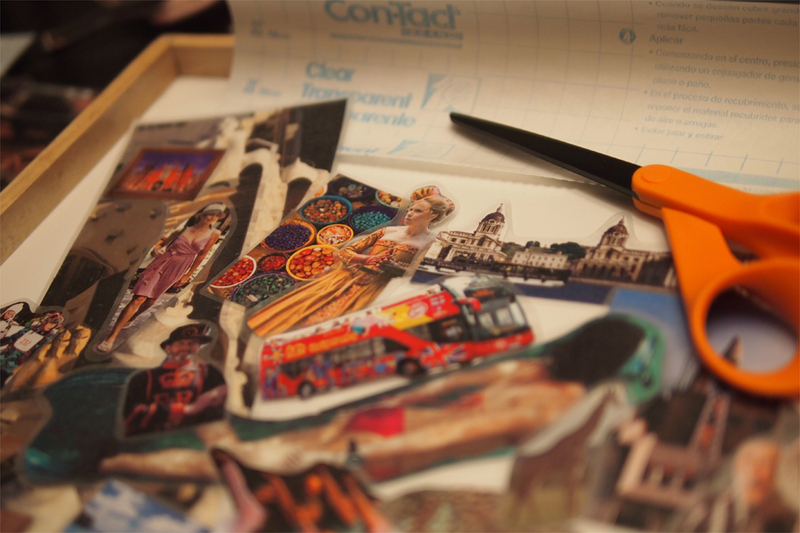 Cut out something you love that reminds you of your trip. Insert in a book. Pat yourself on the back. Buy a piece of plexiglass at Home Depot and have them cut it to the size of the top of your desk. Display what you want, place the plexiglass on top, and enjoy. Have your own ideas to add? Please share!